If this rumour it's true , it's a big mistake from CSM's management! They should have renovate Linnea's contract instead of Niombla. With the arrival of Neagu there is no place for Linnea in CSM. Carmen Martin and Linnea are inseparable since their time in Krim so they should know that if they lose Linnea they lose Carmen too. Yeah, it's very common in Romanian media. Brest is a better destination and a more plausible one imho. I hope it's Brest for her sake. Either way, it's bad for CSM if this leaving is confirmed. I agree there is almost no tradition there. But all things have a beginning, there's no exception for a handball club. And what is history if not an endless number of beginnings? Despite the poor history here, this club managed to win an important trophy in a very short time and deserves the respect for this achievement. I know one could say money did everything, but I know at least two cases where it hasn't. So it's not fair to compare Bucharest to Buducnost or Gyor or Larvik or Viborg which are all big clubs full of history, but it might become one. Only time will tell us. And it's not like all players are looking for glory clubs. We just witnessed C. Martin transfer these days. Don't be funny. clubs from Bucharest dominated both Champions League men or women until Hungary to be on map in handball. First Champions League (European Champions Cup) edition of ladies was won by Ştiinţa BUCHAREST. BUCHAREST is the only town in Europe in women's handball with 3 Champions League trophies, each being different also from the capital: Ştiinţa, Rapid and now CSM. Another 100 years will pass, and this record will not be equalised. So I guess the pedigree speaks out for this city. 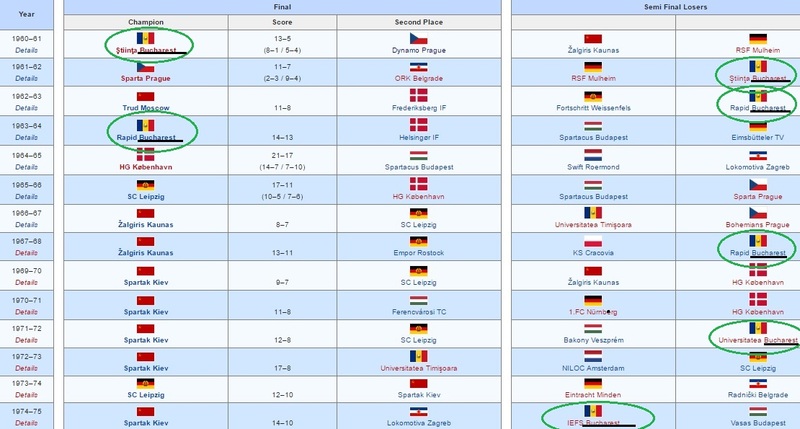 On men, other 2 teams from Bucharest (Steaua and Dinamo) won it 3 times. Last edited by vlad_impaler on Wed Mar 08, 2017 10:43 pm, edited 1 time in total. This is not the point, vlad_impaler. We have to admit CSM Bucharest is a young club and obviously had no tradition. It's not about who's the first or the last. swarthofole wrote: This is not the point, vlad_impaler. First club ever to win the Champions League trophy in handball as debutant (I don't know about the European Champions Cup though). This is HISTORY. And the squad wasn't even the best from handball. For this he can start showing a small sign of respect, not disrespect. Luck or management? Probably also a bit of luck, but certainly big management at least in the days of Constantin Căliman. Cristina Neagu was formed by CSŞ 5 Bucureşti, not by Rulmentul Braşov. Timişoara, Bacău, Oltchim Râmnicu Vâlcea, all failed to win the Champions League (moderated). 3 FINALS, 0 TROPHIES. BUCHAREST 3 FINALS, 3 TROPHIES. On women. Last edited by mikh on Thu Mar 09, 2017 2:07 pm, edited 1 time in total. Reason: Disrespectful for members of mentioned communities. But why your posts have to be always so aggressive? Relax a bit, man! We are not trying to kill bajkalb here, I was just saying I have a different opionion. Last edited by swarthofole on Thu Mar 09, 2017 9:06 am, edited 2 times in total. swarthofole wrote: But why your posts have to be always so agressive? Relax a bit, man! We are not trying to kill bajkalb here, I was just saying I have a different opionion here. Because I am a impaler. ) Just joking. I think you are joking, right? So I became the aggressor? Great! I am never aggressive because of opinion difference, just to know. I am acid with bad people, not with good people, not with people that have different opinion and not with fanatic fans, lol. I like how you added the little green circles. As if we are some imbeciles who can't recognise the romanian flag. HB9 wrote: I like how you added the little green circles. As if we are some imbeciles who can't recognise the romanian flag. Leave him be. What he said about Bucharest and Csm are just misinformations (to use a delicate word). vlad_impaler wrote: Because I am a impaler. ) Just joking. I think you are joking, right? So I became the aggressor? Great! I am never aggressive because of opinion difference, just to know. I am acid with bad people, not with good people, not with people that have different opinion and not with fanatic fans, lol. Do you really believe what you write? Alternative facts? Man, there's a place for you in the Trump administration. I think, there is a bit misunderstanding here. I really respect CSM and what they've done, but I'm also fed up with some comments (without decent source) about Quenn Neagu, who just home even lower money, Bella Gullden who is in Bucharest because of the fans, and sentimental thoughts about Majda. My post was deleted for nothing. I said Swarthofole not to twist my words ONCE AGAIN because I only wanted a bit respect from Bajkal, not to discredit him or a country. Sorry. Seems like Line Jorgensen had another injury. It is very possible she will leave this summer because she has a clause in her new contract. She must be healthy at 1st of July if not the contract will be terminated. sphinx wrote: Seems like Line Jorgensen had another injury. It is very possible she will leave this summer because she has a clause in her new contract. She must be healthy at 1st of July if not the contract will be terminated. It is hard to finde a God RB, Anna Gross has contract with Metz, Lacraber prolonged with Vardar. But Amanda Kurtovici can be an option. Amanda Kurtovic is the best option, not "an option" , better than Gross and Lacrabere. It was said that csm will look better from next season. Except Neagu there are not any new players yet. I'm still waiting for some news but nothing yet... maybe next week. He said that the city of Bucharest has 3 wins with 3 DIFFERENT teams...so this part he got it right didnt he? Using a "delicate word" of course you may noticed the romanian flag but you didn't those little green circles because it is obviously our mutual friends know only three colours : 1.green 2.green 3.green thats why clubs like Gyor is playing in green,FTC is playing in green.... Did this little detail say something about our friends ? SOLD OUT for CSM-FTC. All the tickets were sold. Is this true? I didn't check on Eventim. It is possible to see a few hundred tickets in the days prior to the game.